Robert Gillies is a Solution Architect at Microsoft in the US Public Sector Services CTO organization focusing on Unified Communications. Robert has been at Microsoft since Nov 1999, and spent most of that time as an Exchange consultant in the US Dept of Defense and US Federal Civilian space, helping customers deploy and manage all versions of Exchange from Exchange 5.5 to Exchange 2010. Robert is a Microsoft Certified Master (MCM) in Exchange 2003, 2007 and 2010 and Microsoft Certified Architect (MCA) in Exchange 2003 and 2007, has been involved in the "Exchange Ranger" community since January 2003, has instructed some of the Exchange Ranger rotations, and has developed material for and instructed in almost every Exchange MCM rotation to date (he didn’t instruct in the rotation he just attended). Robert has spoken on Exchange at several internal Microsoft and external events (TechReady, TechEd, Interact), has developed material for and presented Exchange 2007 and Exchange 2010 Ignite/RAMP training, has written/co-written multiple entries on the Exchange Team Blog and has contributed to the Exchange 2010 IP and service readiness documentation. 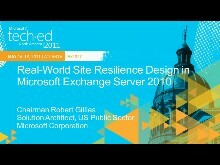 If Chuck Norris wanted to deploy Exchange Server, he would hire Robert Gillies.